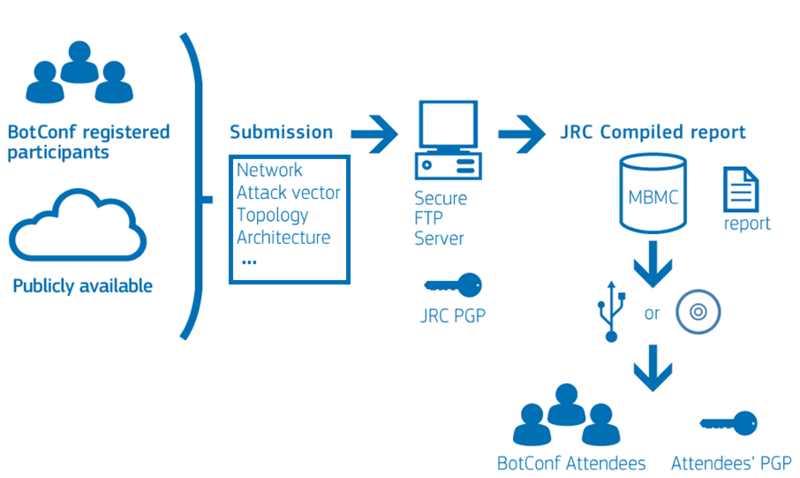 The Digital Citizen Security Unit of the Institute for the Protection and Security of the Citizen at the Joint Research Centre proposes to build a comprehensive collection of mobile botnet malware samples, namely a Mobile Botnet Malware Collection (MBMC). The MBMC will promote systematic research efforts towards understanding mobile botnets, allowing for experiments to be replicated and for a common basis of understanding to be established. Contributors will form a knowledge-sharing community focused on mobile botnet malware. Be part of the MBMC community. The sensitive nature of the collected malware will be handled by strict security mechanisms to ensure that it will be distributed only to registered, authorized participants of BotConf 2015. A secure, online submission system will be put in place for the registered participants of Botconf 2015. Invitation to submit will appear shortly on the website of the conference but only those users that will have registered to the conference will be provided with the address of a secure FTP server with solely write access in order to upload their entries. Each submission will have to be encrypted with the PGP/GPG public key that the JRC will generate for this process. The JRC team will then compile the received elements (every submission shall be completed with a brief form (provided by the JRC) describing the element submitted with all information available) into the MBMC to be distributed to the participants in a digital medium, i.e. DVD or USB. Along with the code of the different mobile botnet malwares, participants will also receive a small report summarizing information on the various submissions, e.g. type of malware, functionality, platform, botnet operation. To ensure that only authorized users have access to it, the collection will be encrypted using the PGP/GPG public key of each participant as provided in the registration process. A continuously evolving collection of mobile botnet malware samples will greatly benefit relevant research and development efforts.